This cabinet card portrait of Dr. John Charles Uhler (1846-1917) is one of a number of photographic portraits of dentists from, based on the period ink identifications, what appears to be the same collection. Born in Baltimore to merchant Erasmus B. Uhler (1818-1883) and Elizabeth (Deady) Uhler (1816-1893), John Uhler’s claim to renown is that he was among the first faculty appointed to the School of Dentistry established at the University of Maryland in 1882. Starting as Demonstrator of Prosthetic Dentistry, he became Associate Professor of Prosthetic Dentistry in 1900. The new school was built upon the institutional foundation of the Baltimore College of Dental Surgery. Said to be the oldest school of dentistry in the world, the Baltimore College of Dental Surgery was established 1839-1840 with a charter from the State of Maryland. With this charter, the organizers created a new degree, the Doctor of Dental Surgery. Uhler obtained his degree there in 1867, and established a private practice. Howard’s 1873 The Monumental City includes an advertisement for the college, then located at Eutaw and Lexington streets, that depicts a Second Empire-style three-story building with mansard roof. 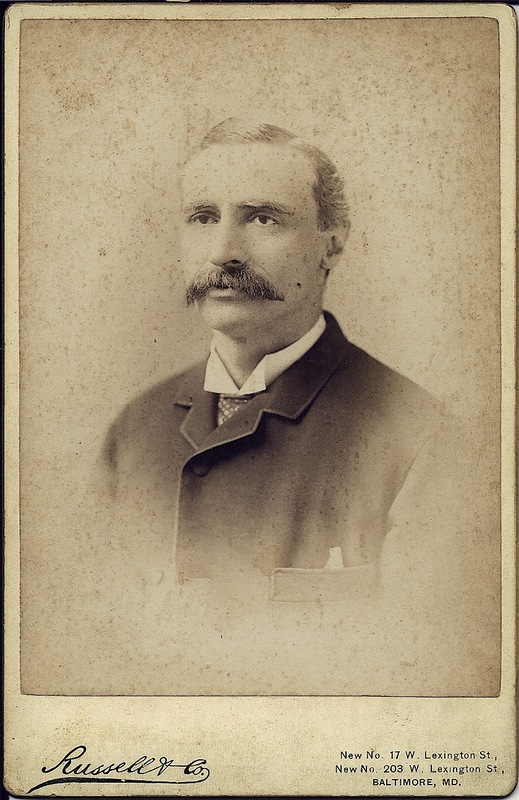 Uhler was elected one of the first members of the Executive Committee of the Maryland State Dental Association in 1883. In 1910, he lived with his sister-in-law and niece, Clara and May Uhler, at 938 Madison Avenue. Uhler retired from his practice and from teaching about 1913, and is buried near his parents in Greenmount Cemetery. It is unclear whether the studio, Russell & Co., is related to that of William C. and Dora Russell. Kelbaugh’s Directory of Maryland Photographers dates the addresses to 1888; the presence of “new” means the photograph had to have been taken after the re-numbering of Baltimore streets that occurred in 1887. The operator chose the popular vignette style for this head-and-shoulders portrait, burning out the background to create a soft, floating effect. Light falls from the upper left to create shadows that emphasize the Uhler’s appealing eyes, which gaze away from the camera as if he were thoughtfully contemplating the past and future of dentistry’s development.